Every time I go home to visit family on Maui, there are a few places where I make a point to stop and Sam Sato’s is always at the top of my list. Tucked into a cozy booth, digging into my usual order “small dry, no sprouts” and looking up at my family hunched over their own bowls, it just tastes like home. Sam Sato’s is famous for their “Dry Noodles” which are local saimin noodles, fried up with char siu, green onions, and been sprouts, and served simply with a bowl of dashi on the side. 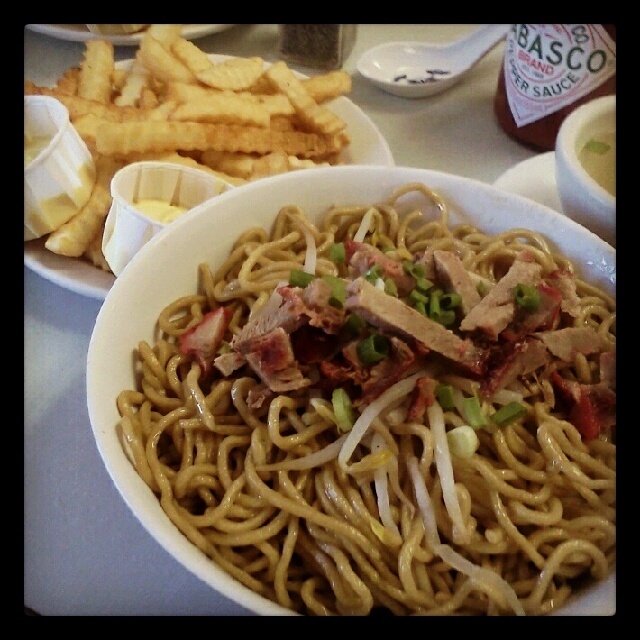 Although the “dry” style is really the way to go, if you choose you could also try local noodle favorites like chow fun, saimin, or won ton mein. Popular sides are teri beef sticks, kim chee, or french fries. On Maui, the traditional “sauce” to go with your crinkle-cut fries is a mixture of mayo and mustard. On the way out, be sure to pick up a box of manju, a flaky little pastry stuffed with a sugary-sweet lima (my favorite) or azuki (traditional) bean filling. They also make delicious little turnovers in satisfying flavors like apple, pineapple-peach, and blueberry. You can mix and match, and a box of these make perfect omiyage to take home to friends and coworkers! Perfect! Leaving for Maui tonight! Ooh, have fun! Working on a few more Maui posts too… you HAVE to go to Star Noodle if you haven’t eaten there yet. Check out the pictures on the Shoyu Sugar Facebook page! I second Star Noodle! Also I just wrote about Isaac Bancaco at Humuhumu but he just left for the Pineapple Grill and I’d definitely head there. Awesome! I’ve got a whole list for the next time I make it home… Mahalo for reading!